I’m going to jump on the bandwagon and talk about what everyone else has been talking about the past few days: Sandy. The “frankenstorm” that hit the northeast, leaving millions without power, has also hit the home where I live. I woke up early yesterday morning to peek outside before reporting to the hospital for work, and being the snow-bunny that I am, my eyes were delighted with what they saw. Before the busy-ness of the day started, I took a few moments just to savor the glorious white of the powdery film on the trees. When I was little I would wake up EARLY on two hour delays to go out and play in the snow, and I am still a big fan of winter activities: cross country skiing and ice skating being at the top of the list. So although I’m not quite accustomed to a snowstorm at the end of October, I wasn’t completely opposed. Then a resounding “CRACK” and a faint flash captured my attention. A limb fell in the front yard, and the “host dad” that I’m staying with attributed the flashes to exploding transformers. The reality of a storm isn’t always pretty. And this is a record-breaker- I don’t have to pull together the stats for you- it’s all over the news. And I’m sure it’s hit home for a lot of my readers, considering how widespread it was! 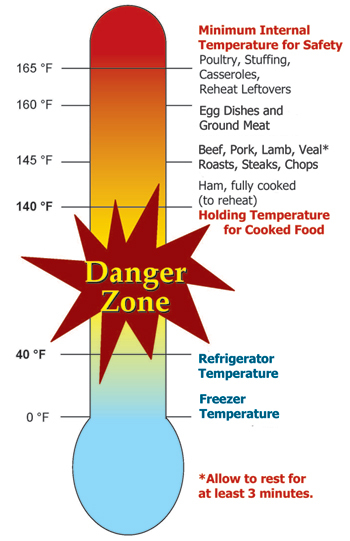 When refrigerator and freezer units lose power, temperature will rise, bringing food into the “danger zone” where bacteria grow most rapidly. The refrigerator will keep food cold for about 4 hours unopened, and a full freezer can maintain temp for about 48 hours (24 hours if half full) and you keep the door closed. Food can be safely refrozen if it still has ice crystals, or is lower than 40 degrees Farenheit. My recommendation is that if you have some meat that has thawed to just above 40 and your power has come back on, go ahead and cook it up, and then quickly chill and refreeze it. It’s no different than if you had intentionally been defrosting meat to cook. 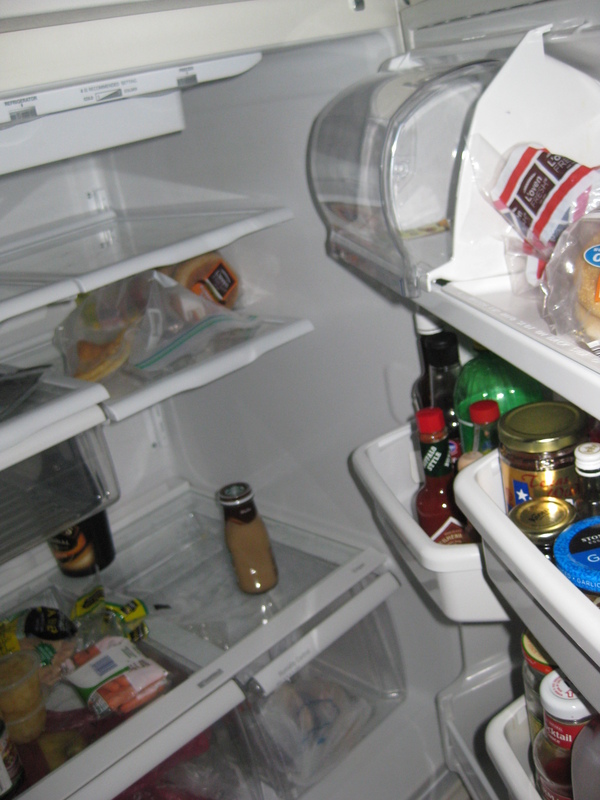 Here’s a picture of the fridge- which was without power for more than 4 hours. The only things we left in the fridge were things that don’t really need to be stored below 40 degrees, such as carrots, bread, apples, condiments, etc (and my “host dad’s” bottled Starbucks cappucino!). If the weather is less than 40 degrees outside, and you have a safe place to keep food where animals won’t get to it- you can set food outside for a short while (This statement is not taken from the USDA- this is my own common sense speaking). And what exactly does one eat during a power outage? Well, last night we fired up the grill for some fantastic turkey burgers, and the grill even has a gas burner so we were able to cook up some green beans, and finish off the lettuce that was in the fridge. Don’t take any chances- never taste food to test safety. If in doubt, throw it out! Food safety recommendations courtesy of the WVU Extension Service. ps. To write this post I visited a nearby Panera (we’re still without power! ), and a lot of others here are without power as well. For example, there’s a little 4-year-old girl singing a song about “Susy has power”… And there’s a long line- I don’t usually go out to eat during the week, but the staff are yelling “No more potato soup!” Everyone’s ready for some hot and tasty food, and a warm place to enjoy it. Categories: Food Safety, Wellness | Tags: dietetic internship, extension service, food safety, health, nutrition, the danger zone | Permalink. After completing three weeks in a rotation at a community hospital where I was learning about clinical dietetics as well as patient services, I began a rotation at WVU Extension Services this week. So far, I have been learning more about the role of Extension Services here in West Virginia and the resources available for community education programs. West Virginia University is a land-grant institution, so there is a mandate to share research based, practical information with the people of the state. “WVU Extension Service educators and volunteers build and help sustain collaborations and partnerships with people and organizations in West Virginia, to improve their lives and communities. In each of WV’s 55 counties, the Extension Service helps people to protect their resources, increase their income, improve their health, and build their leadership and career skills. Yesterday I had the opportunity to see some of the community work that Extension Services does by visiting two sites where a summer literacy program is held. This program is known as “Energy Express”, and you can find out more about it by clicking here. It was great to see the children engaged in creative summer learning, and they also receive breakfast and a family-style lunch as part of the program. School walls were filled with arts and crafts, and little tents and reading nooks in the rooms made the setting an inviting place to learn and expand young minds. Categories: Community Nutrition | Tags: extension service | Permalink.